If you're trying to stir up a crow's nest or get that Ole' Gobbler, this is a very easy call to master. The Crow is one of the cleverest birds in the field, make them work for you! 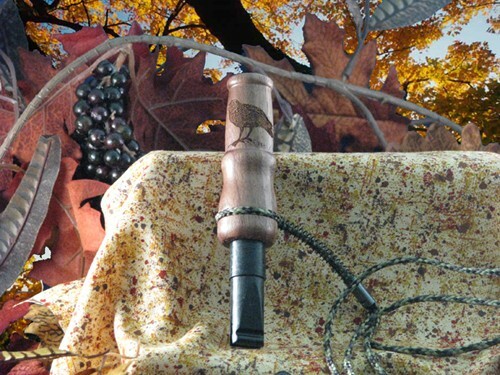 Crow call features all natural woods and an image of a Crow engraved into it, includes the lanyard. Measures 5" x 1". The USA made hunting calls are Amish handcrafted using selected premium hardwood combinations. The hardwood combinations are selected by a skilled Amish craftsman who has studied wildlife for years perfecting his calls to provide the richest natural tones of any hunting call made. Hunting calls are our backbone initially launching Cottage Craft Works and CCW Hunting Calls. Since our introduction to the market in 2006, our beautiful Amish handcrafted hunting calls have become very popular. They sound as good as the look. With our custom engraving option, the calls have become even more popular as wedding party and personal gift options.